The Women’s DVD #1 presents all of the classes of the WOMEN’S PHYSIQUE, WOMEN’S BODY FITNESS (FIGURE), WOMEN’S MASTERS BODYFITNESS & ARNOLD MODEL SEARCH. See all of the lineups, key comparisons and callouts plus posing by the top 5 competitors in each class of WOMEN’S PHYSIQUE, and all awards and OVERALL POSEDOWNS. The Women’s DVD #1 presents all of the classes of the WOMEN’S PHYSIQUE, WOMEN’S BODY FITNESS (FIGURE), WOMEN’S MASTERS BODYFITNESS & ARNOLD MODEL SEARCH. Spread over 2 DVDs this year, it is the BIGGEST WOMEN’S CONTEST SERIES we have ever released! PHOTO GALLERY – BODYFITNESS & PHYSIQUE. PHOTO GALLERY – ARNOLD MODEL SEARCH. See all of the lineups, key comparisons and callouts plus posing by the top 5 competitors in each class of WOMEN’S PHYSIQUE, and all awards and OVERALL POSEDOWNS. All classes for each division are shown from prejudging through to their finals, and then on to the next division. 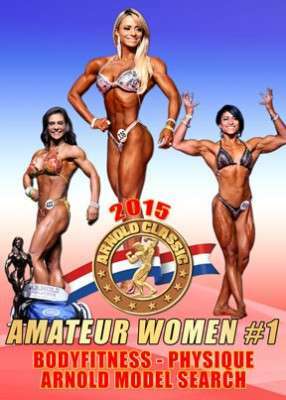 These are the best female amateur athletes in the world.